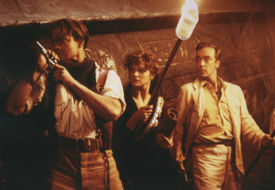 Rick helps Evelyn to kill Imhotep after being saved by her from being hanged. Clever but clumsy egyptologist Evelyn O'Connell (maiden name Carnarhan) relives the glory of ancient Egypt in picture books and manuscripts at Cairo's Museum Of Antiquities. Life among her books was dull indeed. With the help of a certain dashing American, Evelyn's life is about to become a whirlwind of romance, danger and a chance to make the greatest archeological discovery ever. In the Mummy Returns, Eve discovers that she is the reincarnation of Nefetiti, an ancient Egyptian Princess. Jonathan is Evelyn's brother, who is also the comic relief. He helps turn Imhotep mortal in order for Rick to kill him. In The Mummy, Ardeth Bey is a member of the Medjai, the Muslim descendants of the original Medjai - the Pharaoh's sacred bodyguards; a group, who have watched over and guarded Hamunaptra and Imhotep's tomb inside (and beneath it) to do all in their power to prevent his release, a task they have been doing for centuries. Ardeth Bey quickly becomes an ally of Rick O'Connell and Evelyn Carnahan in their attempts to stop Imhotep. In The Mummy Returns, Ardeth Bey returns as an ally of the O'Connells. He goes through many trials to stop the release of the Scorpion King, but doesn't succeed, and unfortunately, the Scorpion King is released. He is Rick's old Hungarian war buddy who abandoned Rick during a battle with desert raiders. He leads a group of Americans to Hamunaptra, but while there betrays them and begins to work for Imhotep after being promised treasure. Eventually he was devoured by scarab beetles. Ironically, he died in the temple's treasure chamber, surrounded by his desires. The Scorpion King is a minor character in The Mummy Returns. He appears in a Flashback at the beginning of the Film and at the Finale he is the Enemy. Imotep tricks him making Rick fight him. Eventually Rick kills him with a Spear. And Imhotep dies and goes back into the underworld with sadness because Anch-su-namun left him. He finds out after that it was not true love like Evi and Rick O'Connell. In Scorpion King, Mathyaus is a Warrior who is hired to kill the sorceress, but eventually teams up with her and kills Memnon. He then claims the throne as the Scorpion King.